Lock in a great price for Sheraton Shanghai Hongkou Hotel – rated 8.1 by recent guests! 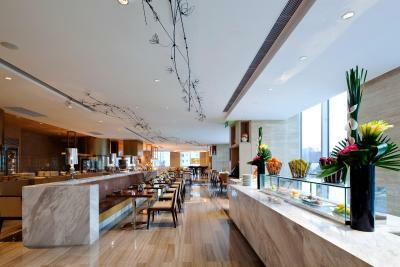 it's a wonderful hotel and staff were very nice and professional, especially Karl in the all day dining restaurant. It was a nice stay. 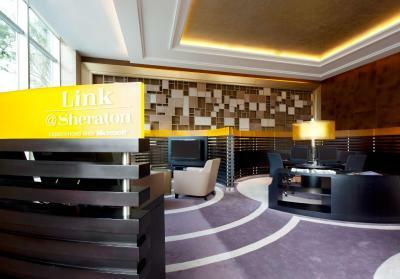 The room was clean, the staff were friendly and the hotel location is close to a metro station. I booked a room with The Bund view but when I got to the hotel it was sold out maybe because I made a last minute booking and they didn't see my booking in their system right away. They upgraded me to a bigger room with free breakfast which was fine for me because you can chill at the Sky bar with a great view of The bund. Staff at Lounge is friendly and cooperative. Speak good english. Polite. 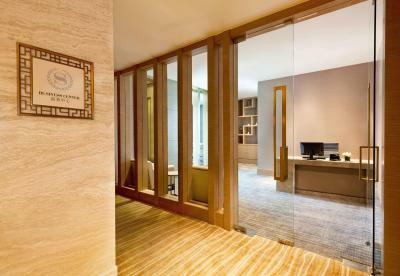 Different to the front desk and Concierge. Metro station was near. 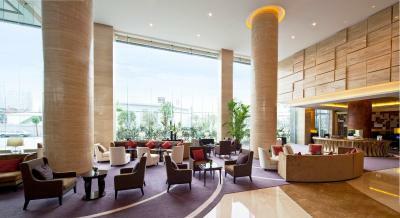 Ambience, friendly staff, nice rooms, good value for money. For family of our size, better if one of the beds was extra large in the twin beds room. The service was very good! They also have great facilities and comfortable rooms. The staffs were really nice and friendly. The room was comfortable with all the necessities provided. 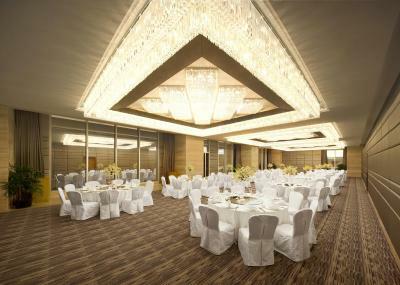 the room was very nice. A lot of space, comfortable bed and clean bathroom. 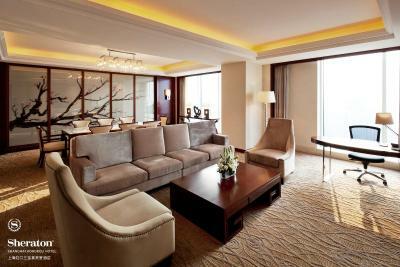 One of our top picks in Shanghai.Sheraton Shanghai Hongkou Hotel is located in North Bund area, with a 2-minute walk from Hailun Road metro station (line 4 and line 10) and a 7-minute drive from The Bund. 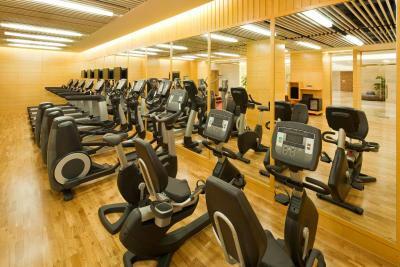 It offers a spa, an indoor pool, a fitness center and 1,880-square-yard event space with high-ceiling ballrooms and 11 function rooms. 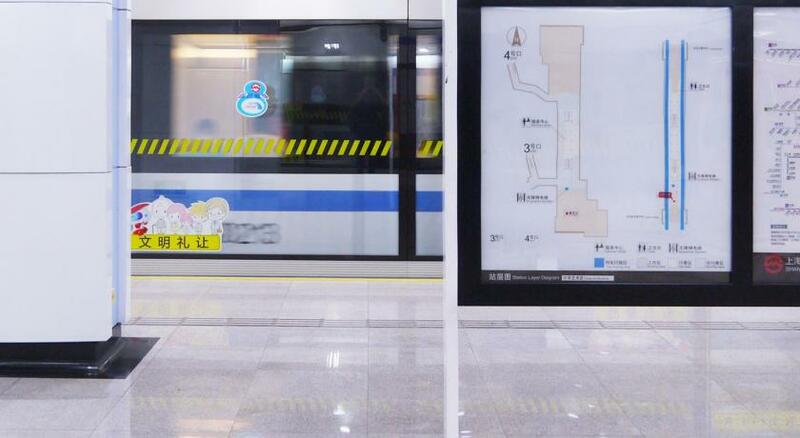 It is only 3 subway stops from the bustling Nanjing Road Pedestrian Street. 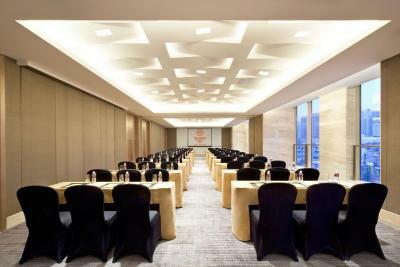 Hotel Shanghai Hongkou Sheraton is a 10-minute walk from the shopping belt of North Sichuan Road and a 10-minute drive from Lujiazui Financial District. 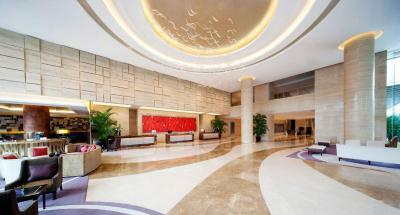 Hongqiao International Airport is a 35-minute drive away and Pudong International Airport is a 45-minute drive away. Free parking is provided on site. 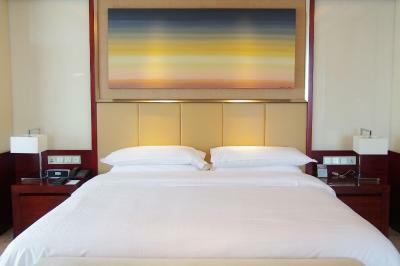 Spacious guest rooms are fitted with a flat-screen TV with cable channels. Each is equipped with a personal safe, a mini-bar and a kettle. 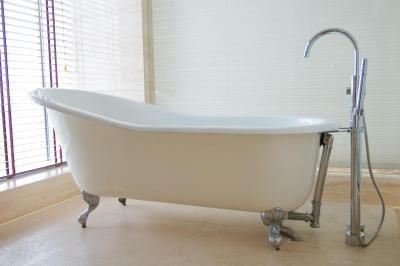 The private bathroom provides free toiletries, slippers and a hairdryer. 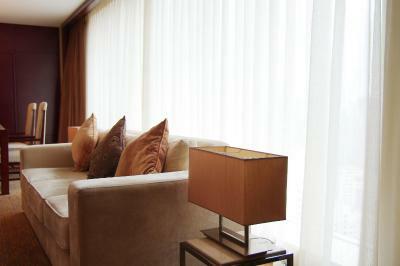 Shine Spa features an extensive menu of massage services for guests to enjoy. 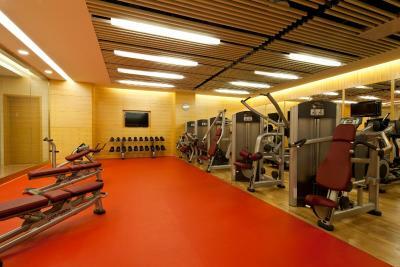 The Sheraton Fitness Programed by Core® Performance features state-of-the-art fitness equipment. 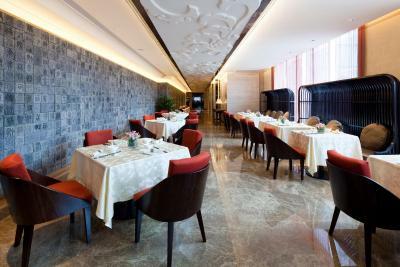 Yue Restaurant serves a selection of Cantonese cuisine. International delights can be found at Feast. 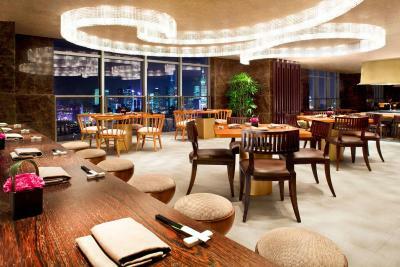 Miyabi offers Japanese delicacies. 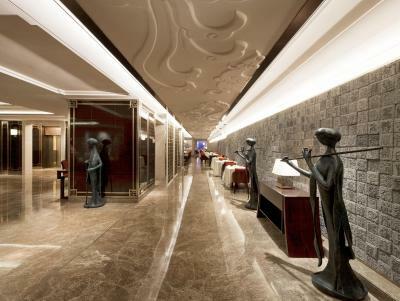 Hongkou is a great choice for travelers interested in architecture, sightseeing and culture. 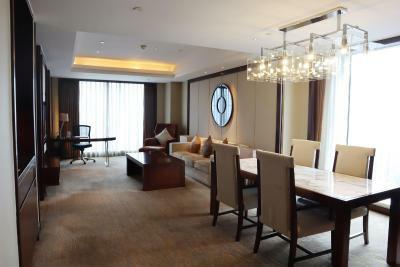 When would you like to stay at Sheraton Shanghai Hongkou Hotel? This double room features a bathrobe, hot tub and air conditioning. This twin room has a mini-bar, hot tub and electric kettle. 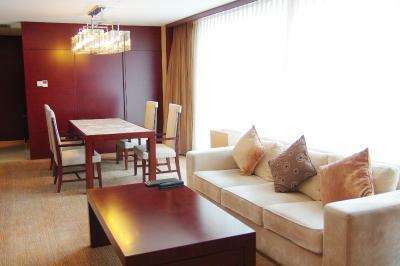 This double room features a tea/coffee maker, sofa and flat-screen TV. 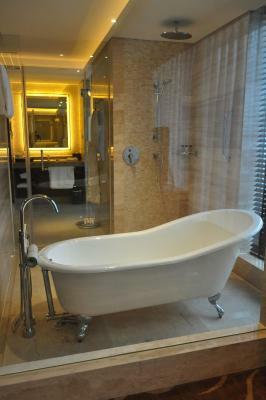 This twin room has a hot tub, executive lounge access and satellite TV. This twin room has a sofa, seating area and hot tub. This suite features a iPod dock, soundproofing and hot tub. This suite has a electric kettle, soundproofing and bathrobe. 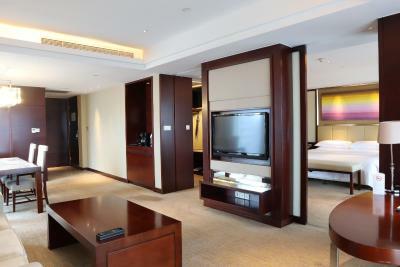 This suite features a hot tub, bathrobe and iPod dock. This double room has a garden view, satellite TV and bathrobe. This twin room features a bathrobe, electric kettle and mini-bar. This double room has air conditioning, hot tub and tea/coffee maker. 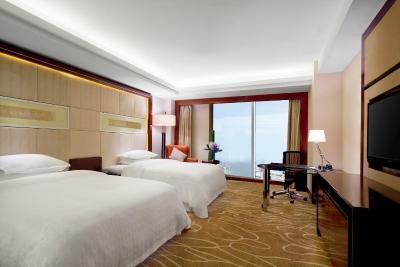 This twin room features a iPod dock, mini-bar and air conditioning. 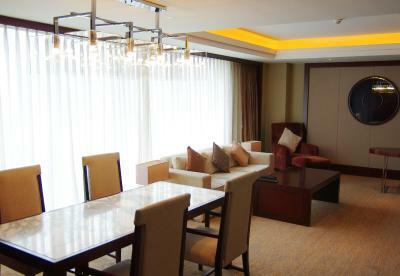 This suite has a seating area, air conditioning and tea/coffee maker. 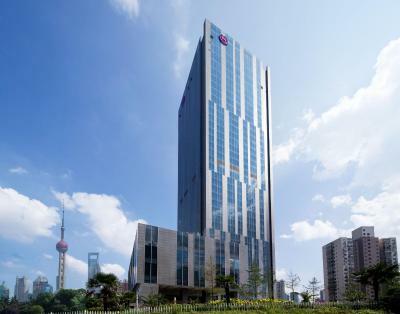 The Sheraton Shanghai Hongkou Hotel is ideally located on Siping Road in the North Bund Area, convenient to everything with Metro Lines 4 and 10 nearby. 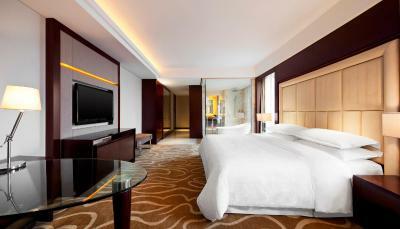 Shanghai Pudong International Airport (PVG) is just 40 minutes away and Shanghai Hongqiao International Airport (SHA) is a 20-minute drive from the hotel. 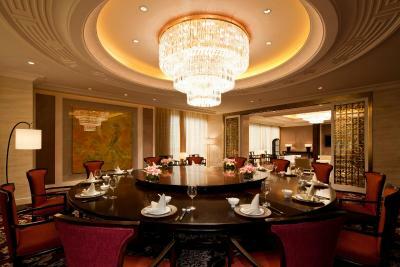 House Rules Sheraton Shanghai Hongkou Hotel takes special requests – add in the next step! All children under 6 years are charged CNY 373 per night for extra beds. 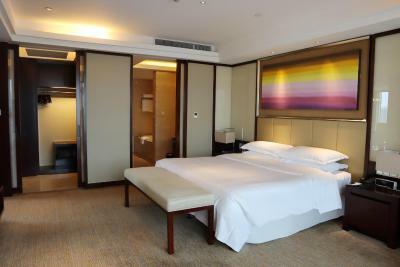 Any additional older children or adults are charged CNY 373 per night for extra beds. 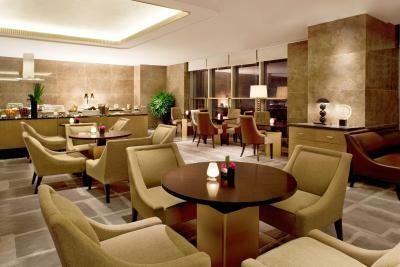 Sheraton Shanghai Hongkou Hotel accepts these cards and reserves the right to temporarily hold an amount prior to arrival. This hotel has a serious problem with the no smoking policy. 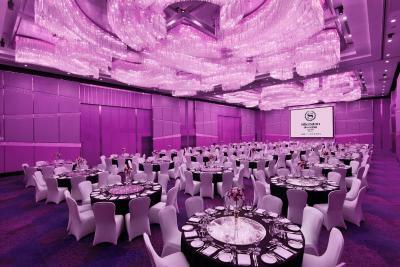 It's very disappointing to spend a big money in nice room which smells so much of smoking all the time. 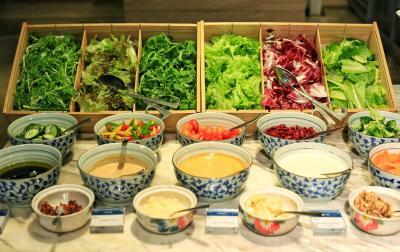 It's not that I don't like it but just a heads up, the breakfast is more on Chinese dishes. It's maybe not worth for your money if you pay extra for it and you are expect excellent western food.I'm sure you can find a proper western restaurant outside somewhere like in the French concession :). Everything was fine, except at the Check in. Staff speaks very poor english but that was Not a problem. A Problem was that they asked me for an in Advanced deposit from my credit Card. Don't you trust your customers? I am Not staying at a 5 Star Hotel to be treated like a Potential thief! Any Hotel asking for an Advanced deposits for Services like mini Bar and Hotel restaurant (which most customers do Not use anyways) is totally unserious! Stop this practise or lose your customers forever. After a very long discussion with the Staff apparantly the deposit is totally voluntary but only after costing me a Lot of nerves :-( Also no free WiFi in the rooms. How can this be 5 Star? Very comfortable bed. Clean Room. Huge and clean bath Room. 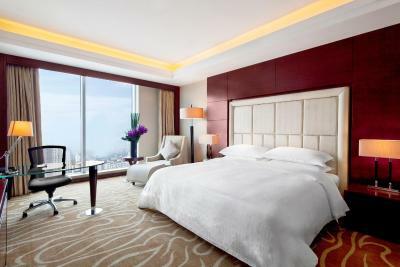 The property of the room is not good as before and some equipments in the room have to be changed or repared! 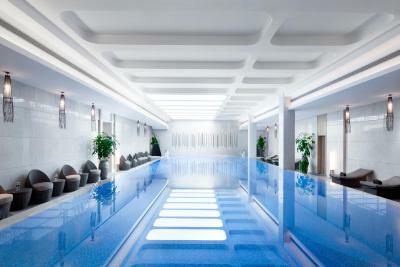 Hi, I stay at your hotel every year when I back to visit my family in Shanghai, the staff is excellent: smiling, flexible, nice, and the service is efficient! Amazing place with a great breakfast and a friendly and prompt staff. Near to the subway station. 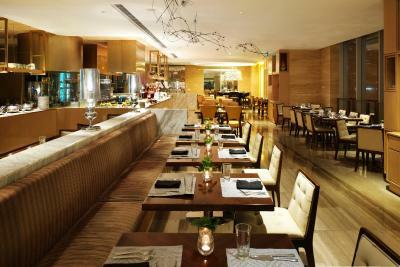 There are no many dining options close to the hotel but the metro is right there. Easy access to metro I appreciated very much being able to have late check-out even later than normal. I was very disappointed with the service of Sheraton. They have 2-3 restaurants and food was so so bad and not worth the money at all. 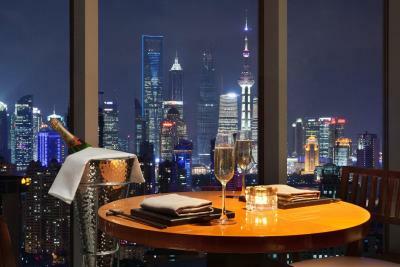 I have had better food in Shanghai in smaller food joints. The staff is poorly equipped. For room service or house keeping they would turn up 20-30 mins later. Stay is also not worth the money at all. 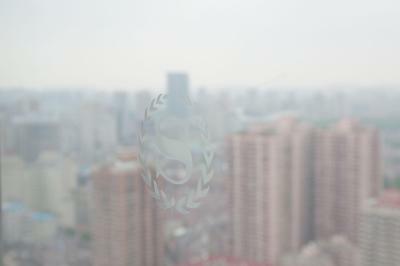 I liked the view from Sheraton got to see a different view of the Shanghai skyline. Also they upgraded me. Thanks for that. 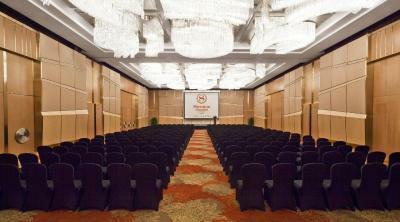 Very well made and spacious room. Cute robotic bell boy who gets you water and small services from the lobby.